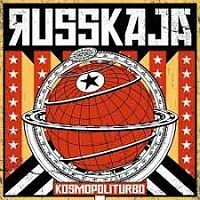 Well this certainly lives up to its tag of alternative - it kicks off with something that feels part traditional Russian and part reggae, with subtle hints of more overt ska tinkling away in the background. It is well done but I don’t especially like it that much as opener “Hey Road” spreads out. That’s a summary of the vibe throughout, a bonkers fusion that does seem to work somehow. Part of this is down to the strong, if quirky, vocal that really drives the piece along. The music is then a bit of an incidental contributor a lot of the time, it’s all about him. The bass and drums just keep a beat, any guitars are largely anonymous and it’s left mostly to occasional horn bursts to provide any real musical feature. Guitars do get some chances to flourish, such as on the up tempo “Cheburaschka”, but any time they do appear it is more of a noisy flourish, the musical parts pushed to the background and the vocal to the fore, these bursts aside. It’s hard to know what to make of this. It’s undoubtedly fun and the musicians are cleaerly very good at what they do. But I’m not really much of a fan of this sort of fun light rock with a twist. They’d bring a lot of smiles filling a quick half hour slot at a festival but I wouldn’t really want to sit down and listen to them at home, like I just have.